Joint providership is a process that can be immensely rewarding for your association’s members. Access to new educational resources, and expanded or more diverse activity offerings, can revitalize your CME program. But it is also a journey complicated by multiple significant challenges: from finding the right partner to preparing an accreditation petition that requires as much careful planning as your initial accreditation application. If you are a non-accredited potential joint providership applicant, acquiring accreditation for a new venture with a prospective partner will be a painstaking process. In addition to having to “audition” for your accredited potential co-provider, you’ll also need to be ready to submit exhaustive documentation to support your association’s readiness to meet ACCME standards. We’ve prepared a list of tips that will help you focus on critical tasks as you develop your joint providership strategy and seek a partner. What is a Joint Providership? Joint providership was called “joint sponsorship” until 2014, when the ACCME made the decision to change the terms in its effort to simplify the language in its standards and requirements documentation. When a non-ACCME accredited CME provider creates and presents one or more activities with an ACCME accredited provider, this is considered a “joint providership”. Now let’s look at some basic facts about joint providership eligibility standards. All CME activities must evidence full compliance with the ACCME Criteria, the Standards for Commercial Support, and accreditation requirements. 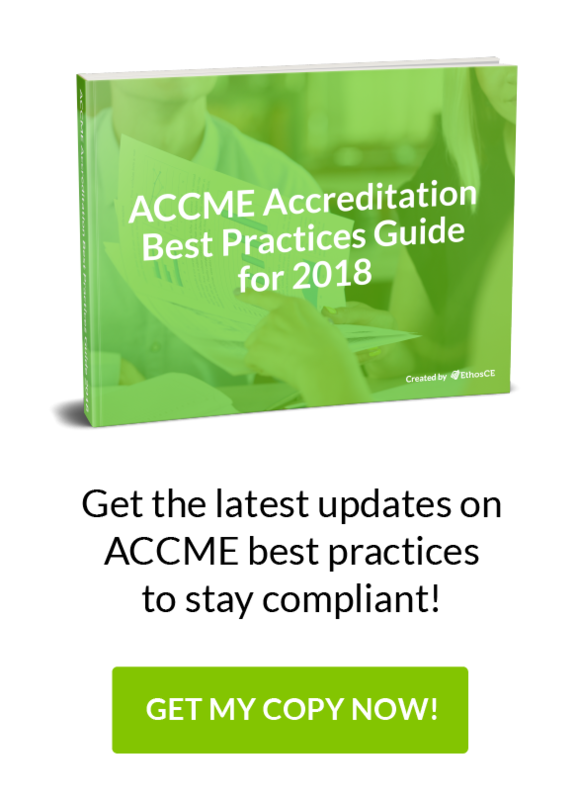 In cases of joint providership, the ACCME-accredited provider bears the responsibility of providing documentation of this compliance to the ACCME. A commercial interest cannot be the unaccredited provider in a joint providership. Accredited providers with a two-year Provisional Accreditation, a four-year Accreditation, or a six-year Accreditation with Commendation may participate in a joint providership. ACCME-accredited providers with probation status may not seek or maintain a joint providership, with the exception of activities that were created and jointly contracted before the probationary designation was given. ACCME has the right to modify this definition and this list of eligible organizations from time to time without notice. When a potential partner is found, you’ll both have to undergo a significant review process before your application is ready to be submitted to ACCME. Here are some of the program components and procedures that your potential partner may request or examine (and that you’ll also need to analyze before finalizing an agreement). Documentation of the process used to resolve financial conflicts of interest among staff, instructors, and the CME program administration. That, of course, isn’t a complete list of considerations. You’ll have to be ready to document every pertinent area of your CME development and management process well before you locate a potential partner. Know your joint applicant’s CME structure as well as you know your own. Full disclosure between you and your partner provider is a must, and shared documentation should match each statement of fact on your application. That means you’ll need to follow strict due diligence guidelines to verify that collected data is recent, relevant, and matches the standards mandated by ACCME. Provide extensive documentation of your partner provider’s ability to maintain independence from commercial interests. Develop a strong narrative that points to specific reasons why your two organizations are stronger together through shared resources. Offer evidence of how your partnership will address your learners’ knowledge gaps, and ways that this can be achieved more efficiently through partnership. Highlight the capabilities of your non-accredited partner to represent the values presented in your mission statement, along with evidence of their ability to support your efforts to effect a tangible impact on physician competencies. Illustrate how your collaboration will continue to uphold a high standard of CME excellence as programming grows. Acquiring joint providership is a process that is challenging to manage alone. For more than 16 years, Ethos CE has offered associations of every size the support and guidance that they need to create successful joint providership programming. We manage applications and documentation and provide compliance self-study updates, and much more, allowing you to view status updates and submissions from a single dashboard. How to Make Your CME Mobile Friendly (Accredited Courses) What Is Your Medical Association’s CME Technology Strategy?